I had the Seidio holster for my old AT&T TyTn II/HTC Kaiser, and I LOVED it -- best built, most rugged, tight-gripping holster I've ever owned. I expect great things out of the Innocase II + holster combo. I've dropped every cell phone I've ever owned; how I've gone nearly two months without dropping the Incredible is beyond me, and I'm done with trying my luck. I'm concerned about the case, the screen and the camera lens. Seidio's Innocase II appears to address case and lens issues, but I wonder about the screen. I may yet get one of those film protectors; last time I tried one was three or four years ago, and they were crap. I hear they've come a long way however. Tip: you can get this $10 cheaper, and with free shipping, from Amazon. I'd seen a cupholder-mounted car mount, but I couldn't seem to locate it today. 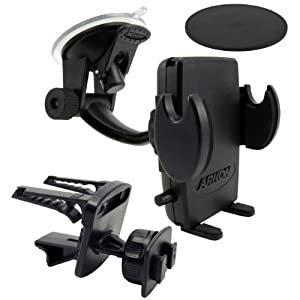 For $16, I'll give the Arkon a try. I am still tempted to upgrade my battery, but $25-$70 for a 1750mA battery -- an upgrade to a mere 118% original capacity -- is a tough sell, and going bigger would mean blowing out the back panel/battery door, and possibly not fitting in cases and holsters. For now, a beefier battery remains on my wish list.